To commemorate their visit to East Sussex on October 31, 2013, the Newhaven Chamber of Commerce presented the Queen and the Duke of Edinburgh with pieces donated by jeweler Mike Shorer and his company Historic Jewellery Reproduction. 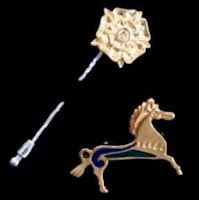 Picking up on the Queen’s love for horses, her brooch is a reproduction of a second century Romano-British horse brooch and is made from gold plated English pewter accented with green and blue enamel. (The Queen is not the only one that may have a replica of this second century piece – other versions up for sale in the past include one at the Royal Armouries Shop* and one previously auctioned on Ebay.) The Duke received a Tudor rose tie pin, also made of gold plated English pewter, which was inspired by Henry VIII’s Mary Rose warship. We have not yet seen the Queen wear her Newhaven brooch. *Thanks to Jelena for this link.